Life Coach in Sheffield - Behind on Your 2019 Goals? Don’t panic and go into a mini-meltdown, consider this instead. We’re into April. We’re a quarter of the way through 2019. If you’re like most of the people who attended my event, started the year with goals and ideas for what they wanted to achieve this year. If you’re like me, you broke down your goals for the year into actions you would take and planned how you would achieve them weekly, monthly and quarterly. You set out to follow your plan, but you didn’t manage to get them done, three months into 2019 and you’re falling behind. Does this sound familiar to you? Because it should. It’s what happens to the majority of people who set goals, especially goals that stretch you. Approximately 80 per cent of people who make New Year’s resolutions have failed six weeks into the year. And it’s not just New Year’s resolutions, typically clients come to see me to stop smoking, improve career prospects, seek alternative employment, manage weight, improve the level of fitness and achieve their business start-up goals. The majority of people who set personal and business goals fall down on those goals somewhere along the way, so you’re not alone. Here’s my advice for when (inevitably) you fail to meet your own expectations. Setbacks in life happen. It’s how we deal with them that sets us apart. If you have something happen that sets you back, use it as a chance to slow down and objectively evaluate what’s going on in your life. Often, it can be a useful sign that something’s amiss and can be altered for the better. I see many people that will be happy when they get that salary increase, or that new job, or that new car, or when their kids graduate from university etc. You know what I mean; it’s the live for tomorrow philosophy that dismisses the only day that really matters, today. As an experienced Life Coach in Sheffield, I believe in a written goal setting, I know that it works for many people and it is something I will always encourage my clients to do. However, you can be setting goals and still be in the moment most of the time enjoying what it is you are doing as much as what it is you want to be doing in the future. Being in the moment allows us to enjoy whatever it is we are doing and to not be beating ourselves up for something we think we should be doing or beating ourselves with some guilt trip from something that has already taken place and we cannot change. It allows us to connect with the people around us and feel a sense of involvement that doesn’t come when we are constantly thinking about what has happened in the past or what may happen in the future. Your happiness and success could be as close as asking a colleague or outsourcing non-essential tasks so that you can focus on the key jobs. Too often, people take on tasks and simply add them to their responsibilities. Eventually, they become tired due to working long hours and this can lead to a deterioration of the task. By delegating some of the responsibilities to others, the load is lightened, and you are more likely to meet your deadlines. Make a conscious effort to stop putting yourself down. To do that, you need to be more aware of your negative self-talk, those chattering comments that you make internally. Compliment yourself on the things you do well; acknowledge all your achievements, no matter how small. Make a list at the end of each day of 3 things you did well, that made you happy, or that you are proud of doing. Write these down and then read them to yourself (out loud if possible) before you go to bed. This won’t eliminate all negative thinking, but if you can move the dial towards the positive, it will shift your energy and self-belief. Because human beings are hard-wired to pay more attention to negative information than positive information, your natural tendency will be to focus on whatever you set out to accomplish but didn’t. Fight that tendency by paying some attention and being grateful to whatever you did get done. Some days, everything seems bad. You’re exhausted, your boss is not at all pleased, you’ve upset your partner, you’ve picked up a speeding fine, and you’re in a dispute with your neighbours. Thoroughly awful. Counter-intuitively, one of the most powerful ways to re-energize yourself on an awful day is to remind yourself of just one thing in your life that is wonderful such as looking forward to your family holiday. Your boss, though unhappy with you today, is actually a cool boss. You may have had a bitter argument with your partner, but you still think the world of them. Research shows that gratitude has a wide range of health benefits, including stress reduction. You just have to bring to mind and acknowledge the positive aspects of your life that exist. 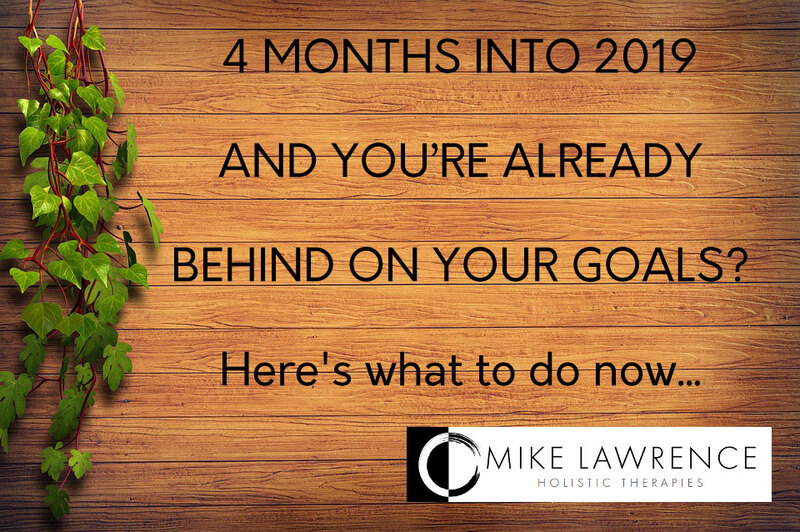 We’re only one-fourth of the way through the year there are still eight months left, which is enough time to complete or make meaningful progress on all your 2019 goals. So, don’t panic, and don’t give in to frustration or exhaustion. You can still get the job done. Sometimes the goal you start out with isn’t the right one, but if you think about it, a different goal or a different approach that makes more sense becomes clear. Not all goal setting is equally effective. Learning to set the right goals and learning how to best achieve them takes time, practice, and a little bit of guidance. Ultimately, your goals are only as effective as the systems, resources, and people driving progress. Revise your plan that you can implement immediately that will ultimately get you back on track and lead to business success.